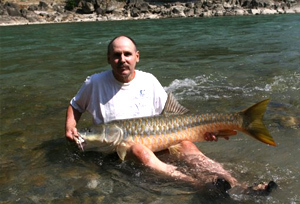 Indian Himalayan Rivers offer habitat to some big Mahseer, thus, attracting anglers from around the world. Angling in some of the great Indian Himalayan regions will allow passionate anglers to explore some remote areas that are accessed through boats. Further, they can enjoy catching endless number of fishes as per their potential while learning about their different types. At Tour My India, we offer an exclusive 12 nights and 13 days Himalayan Mahseer Fishing Tour to satisfy your lust for angling and fishing adventure in some of the finest rivers of north India for angling and fishing. Our tour will take you to some of the exotic angling places where you can enjoy angling and fishing right in the lap of the nature along with the spectacular scenic views, sightseeing and unforgettable camping experience. On arrival at Delhi airport you will be welcomed by our representative & transfer to the hotel. An overnight stay in Delhi. After breakfast, drive to Dhanachuli. On arrival, check-in to the resort. Evening is free for leisure. Dinner & Overnight stay at the resort. Blessed with pleasant weather, breathtaking views of the Himalayas, lush forests & enticing apple orchards, Dhanachuli is perhaps one of the most beautiful places to stay in Indian Himalayan region. Morning is free for leisure. After breakfast, start your journey to Pancheshwar via Shahar Phatak, Devidhura, Dhunaghat, Lohaghat and arrive in the afternoon. Enjoy scenic views of the Kumaon Himalayas while driving to Pancheshwar. An overnight stay in Pancheshwar. At the confluence of river Kali and Saryu, Pancheshwar forms the borders with Nepal and is famous for fishing & Angling destination. 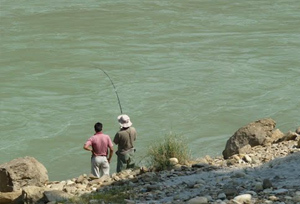 Pancheshwar fishing is most famous because of its ideal location. The Mahseer or the Great Head is a fish that is considered to be the ultimate fishing trophy for those fishing in these regions. While on exciting Mahseer fishing tour you also enjoy the natural beauty of the surrounding forests, streams and the high mountains. Enjoy full day fishing in a productive beat at River Saryu. 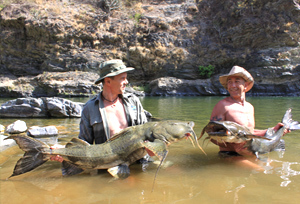 Our experienced guide will be helping and introducing you to various aspects of this amazing and wild fishery. Here, you can expect to catch the fish of your dreams - catch your first thrilling glimpses of the legendary Mahseer of the Himalayas. Return back to Camp for dinner & an overnight stay. Take pleasure of angling at the mighty Mahakali River for whole day. Enjoy a striking river-journey as you float down the Mahakali River with India to your left and the Nepal bank to your right. The main species available on the Saryu & Mahakali rivers, besides Mahseer is Goonch (Bagarius bagarius), which is a fresh water scavenger that thrives in these rivers. Later, return back to Camp for dinner & a night stay. Enjoy another full day in the beats of River Saryu & Mighty Mahakali Rivers with our experienced guide. Return back to Camp for dinner & an overnight stay. After breakfast in the morning, check-out & drive to Corbett National Park. On arrival, check-in to the resort. Evening is free for leisure. Avail dinner & an overnight stay at the resort. Morning at Leisure. After breakfast, board the open jeep to reach at the fishing point. Your next 04 days will offer you a chance to enjoy angling in the well-known Ramganga River, one of the major rivers at Jim Corbett National Park. It is one of the most well-known angling destinations with anglers from all over the world. During your fishing tour, you can catch plenty of Mahseer, Gooch (Giant catfish) and Indian trout. Enjoy fishing the whole day at Ramganga River. Return to the resort in the evening for dinner & an overnight stay. Full day is fixed for fishing at Ramganga River. Enjoy whole day angling on the section which promises some exciting fishing experience. An overnight stay at the camp. Ramganga River emerges from Dudhatoli, which is located at a distance of about 140 kilometers north from the Corbett in the foothills of Himalayas. The river meets the great river of Ganga at Kannauj, after covering a distance of 1080 kilometers. The Upper Ramganga River, on the top of Kalagarh in Jim Corbett, is nourished Sonanadi River. The Sonanadi River drains into the enormous reservoir of Ramganga making it a significant fish habitat in the middle of the park. This water flow meets a confluence named as Domuda in the northeast corner of the park. This river stretches above the park and enters into the sporadic villages with the small temples, terraced fields and ashram in its way. This stretch is approximately of 50 kilometers till Jainal. Jainal provides plenty of fishing opportunities for the tourists who are the freaks of angling. After breakfast, drive to village Bhikiyasen. Arrive Bhikiyasen and relax for some time. Bhikiyasen is the favourite place for professional anglers and one can catch Sizable Mahseer and Catfish at Bhikiyasen. Enjoy half day angling at Bhikiyasen. At night, relax in the rest house at Bhikiyasen or in the camp. After breakfast, enjoy full day angling at different stretches of river at Bhikiyasen. Take pleasure of a night stay at the rest house at Bhikiyasen or at the camp. In the morning have breakfast. After breakfast, check-out from the camp & drive back to Delhi. On arrival in Delhi, transfer to the hotel for an overnight stay. Morning at leisure. After breakfast in time transfer to the international airport to board the flight for home country.